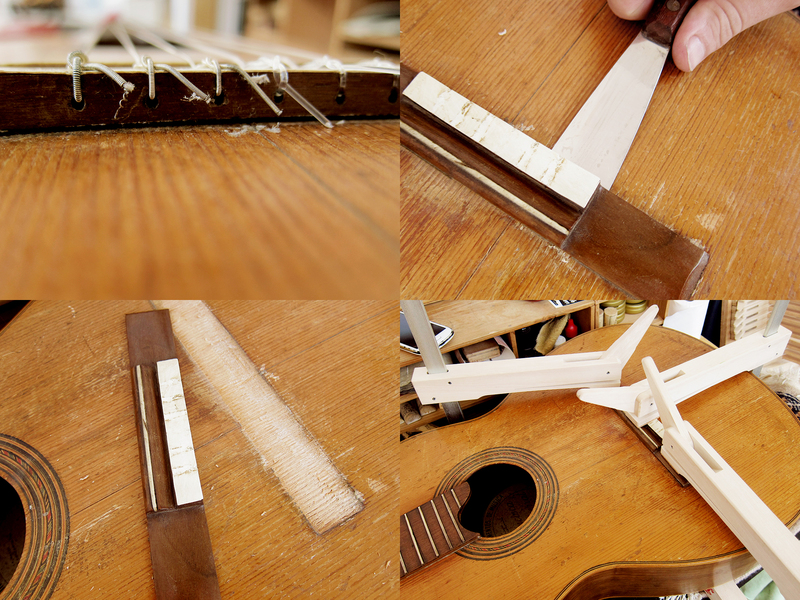 I recently reglued the bridge on my Francisca Montserrat and just wanted to show how easy it is if anyone out there feels a bit scared of doing it yourself. It’s very straight forward and only takes a couple of minutes. Heat a spatula on a normal clothes iron, it’s good to keep a finger on it so it doesn’t get too hot and scorch the lacquer. Insert the spatula under the bridge, start with the edges and work your way to the middle to loosen the bridge. I prefer to reheat often instead of working with a really hot spatula from the start, less risk of damaging the top that way. Be careful when you do the last push so you don’t break it off, it’s supposed to come off without any direct force if the spatula is warm enough to loosen the glue. 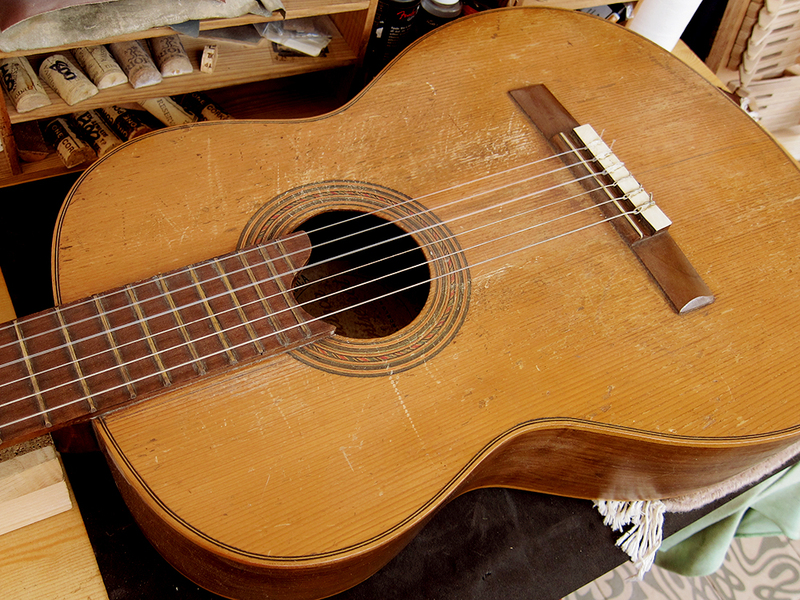 Once the bridge is off, clean the guitar top and the bottom of the bridge with some sandpaper to get a smooth surface. I earlier thought that it was good to scratch the bottom of the bridge with a knife to get something for the glue to grip to but have later been told that’s an old myth and it’s better to keep the surfaces smooth. 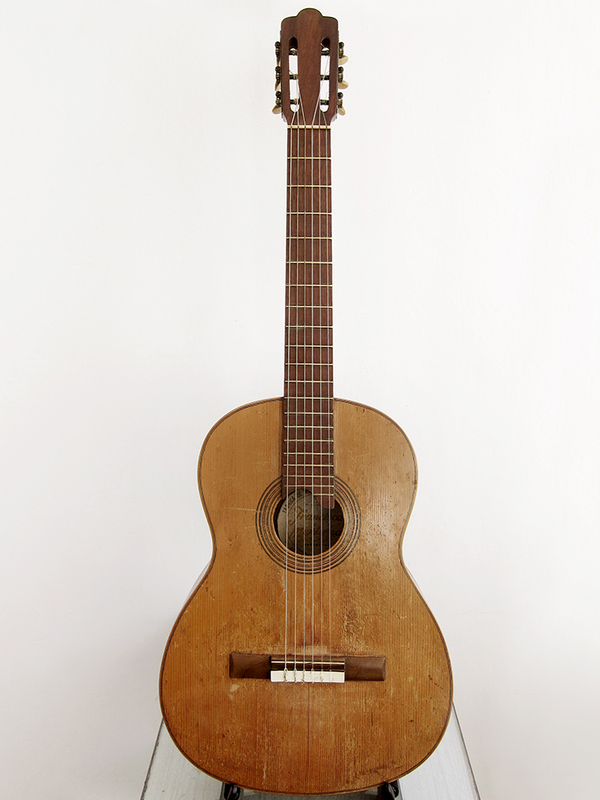 Apply plenty of glue on both the guitar top and the bottom of the bridge, I always use fish glue for my guitars. Put the bridge in place, apply some pressure with your hands and remove all the extra glue that comes out on the side and then apply a couple of clamps to keep it in place over night. I recently got myself a couple of deep throated, 200 x 195 mm, Klemmsia clamps from German eBay that worked great.